George Graham Reviews Corky Siegel's Chamber Blues' "Different Voices"
Just because classical and rock & roll are so seemingly different from each other, there has been a long history of trying to mix the genres going back to the 1960s with groups like the New York Rock & Roll Ensemble and then the Beatles and the classical elements they added to their music. The project range from rock versions of classical pieces to using classical instrumentation and arrangements to perform rock tunes. And there was the art rock scene that brought in elements of both. This week we have a new recording by someone who has been involved with mixing classical with in this case blues, for over 50 years now, and it still sounds like fun. It’s Corky Siegel’s Chamber blues, and the new recording is called Different Voices. As Corky Siegel points out in the album’s liner notes that he feels extremely lucky to have met and played with some of the blues greats like Muddy Waters and Howlin’ Wolf in Chicago, where Corky Siegel and Jim Schwall formed the Siegel-Schwall Band in 1965. They became the house band at a South Side Chicago club called Pepper’s Lounge where they backed up Waters and Wolf, along with Buddy Guy, Little Walter and many others. The Siegel-Schwall Band’s 1966 debut album attracted a fair amount of national attention. That same year, then Chicago Symphony Orchestra guest conductor Seiji Ozawa approached the band about doing a joint work. Composer William Russo created Three Pieces for Blues Band and Orchestra which was released by the classical label Deutsche Grammophon in 1973, and became a classical crossover favorite. While the Siegel-Schwall Band reformed for a while after initially breaking up, and Siegel has done some other blues recordings, Chamber Blues has been an ongoing project for Siegel. He has been commissioned to write works for his blues harmonica and orchestras, and has toured with trumpet man and band leader Doc Severinson doing symphonic collaborations. Chamber Blues consists of a traditional string quartet, Corky Siegel’s blues harmonica and percussion, usually from an Indian tabla. Much of the material tends to be instrumental, with with the contrast in sounds coming together in Chamber Blues’ music. It has been 12 years since the last Chamber Blues album, which was a live recording, but now Siegel is out with Different Voices, which as you might expect, involves some guests beyond the Siegel’s eclectic gathering. They include jazz sax great Ernie Watts, and pop singer-songwriter Matthew Santos. Also appearing is Marcy Levy, who co-wrote the Eric Clapton hit Lay Down Sally. She performs the song with the quirky backing of the Chamber Blues Group. From the more conventional blues world is Sam Lay, who played regularly with the reunion version of the Siegel-Schwall band. And while the music is quite eclectic, it’s done in a lighthearted spirit. 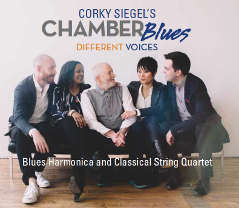 Different Voices, the new album from Corky Siegel’s Chamber blues, the first in 12 years, continues the entertaining and often charming mixture of blues harmonica with a classical string quartet, often featuring Indian tabla. While the previous Chamber Blues albums were mostly self-contained, this one has a number of interesting guests, making the music even more wide-ranging and fun. The compositions are enjoyable, though sometimes melodically they fall into predictable patterns. But overall it’s thoroughly entertaining. Our grade for sound quality is an “A.” Just about everything was done right. The string quarter is more closely miked than traditional classical music recordings, but this is not a conventional classical music recording. The dynamic range, how well the music’s ebb and flow of loudness is preserved, is commendable. Corky Siegel has been mixing classical and blues for 50 years now, and he shows no signs of slowing down. His new album maintains the spirit of fun eclecticism that has marked his projects over the years. Whether you are are familiar with his past work or not, most people with open ears will find this album quite charming.